An Australia Day billboard featuring two girls in hijabs has been removed from a site in Melbourne after threats were made to the company behind it. 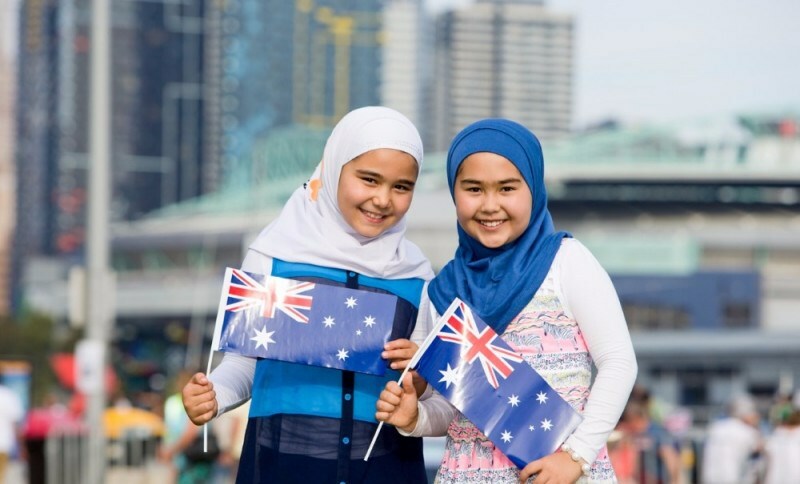 The digital sign featured rolling images of people from various cultural backgrounds, and one picture of two Muslim girls in front of the Australian flag sparked furious debate among social media users. Hundreds of people criticised the image for being “too politically correct” or not a true reflection of Australia Day. On Wednesday a crowdfunding campaign by the Campaign Edge advertising agency called for the girls’ photograph to be reprinted on posters and in a campaign. Within seven hours, the campaign had raised its initial $50,000 target and increased it to $100,000 to fund “multiple billboards across Australia”. Ms Madigan said the idea of a replacement billboard was to show the community that “most Australians are not horrible racists”. “I’m really angry, this was a photo of two young Australian girls celebrating Australia Day,” she told ABC Radio Melbourne. “I feel for the Muslim community, they’re damned if they do, damned if they don’t. A battle over a Victorian government sponsored billboard advertisement of Australia Day that included two young Muslim girls in headscarves waving the Australian flag, provoked a predictable backlash by extreme right wing nationalist groups like the United Patriots Front and their racist followers. Stoking flames of bigoted nationalism on social media against the young Muslim girls resulted in the billboard being removed, the Muslim girls and their families living in fear and a meekly response by the Victorian Multicultural Minister who said it was a “disappointment to see a small minority attack proud Australians.” Such is the significance of this “small minority” until this matter became a national issue shrouding Australia Day celebrations that has reached the attention of the international media. A counter backlash against right wing racism and Islamophobia by supporters of multiculturalism and pro-integrationists of Muslims have used these same Muslim girls for their own political objectives in order to show the community that “most Australians are not horrible racists”. Therefore, the idea of a counter campaign that has crowd funded $110,000 to put the image of these Muslim girls back up across the country has less to do with upholding their sense of “Australianness” and more to do with not being viewed as racist and bigoted fools. However, campaigns aiming to encourage the integration of Muslim Youth is just as unrelenting as the racist campaigns that demand the assimilation of Muslims. The reality therefore, is that Australia is a racist nation and this racism runs deep and far into a historical past, be it against the indigenous Aboriginal population since the arrival of the First Fleet “settlement” in 1788, to the Chinese during the Gold Rush 1800 era, the Italians and Greeks after WW2, Vietnamese & Cambodian refugees during 1970’s and 1980’s and now Muslims in the 21st Century. Therefore, the idea of “bending over backwards to include Muslims” into the Australian society is certainly not characteristic of the racist Australian Anglo-Celtic attitude that dominates the society. Therefore, Muslim youth living in Australia who are struggling to develop their Islamic identity in the face of political pressures to either assimilate or integrate into the society are no strangers to the demands and expectations that secular liberal societies dictate. The futility of the ‘damned if you do and damned if you don’t’ reality for Muslims makes the well-known verse in the Holy Quran ever clearer to us. Therefore, stay firm holding onto your identity oh Muslim Youth. An identity built upon a creed that is consistently derived from a rational Aqeedah that brings contentment and peace to the heart and mind and is capable to unite the hearts of Muslims.